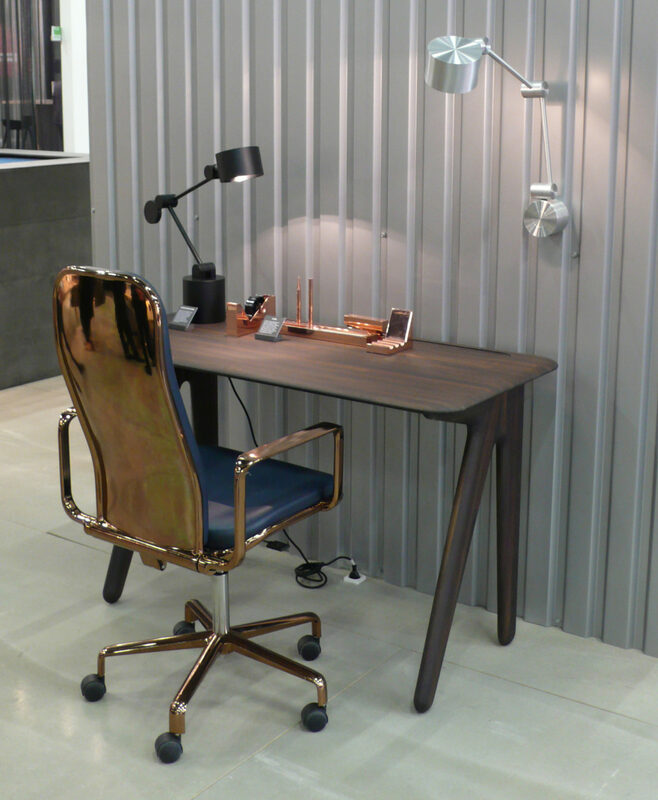 Chic with a twist: The office collection by Tom Dixon mixes the style of Victorian school desks with the luster of metallic surfaces. It is no secret that the office world is changing rapidly. But this not only changes where we work and how. As the current edition of Cologne’s trade fair Orgatec shows, the market for office and facilities furnishings is also in flux. Many established manufacturers are eager to tap new business sectors with lounge furniture or digital tools. But most notably, the new dynamism is creating scope for new players to enter the competition for the highly sought-after contract commissions. The most unlikely new entrant at Orgatec 2016 is arguably Tom Dixon from London. A few years ago the trendsetting label with its metallic luminaires and accessories would have still been unthinkable at a trade fair where swivel chairs used to be paraded and light-gray-beige was considered a splash of color. But the master of dark glamor can now be found in between manufacturers of monitor arms, carpet tiles and acoustic panels. “We think we might be spending too much time preaching to the converted,” Dixon said when talking with Stylepark. We are at the furniture fair in Milan every year, and we take part in the London Design Festival. But that means we are always reaching out to the same audience. It feels good to leave our comfort zone.” Looking around, he smiles, amused: “This here is a little more serious, isn’t it?” The small collection providing the occasion for an excursion into the more serious trade consists of a wooden escritoire, wooden desks and a metal desk lamp. The products evolved from interior projects Dixon planned and outfitted with his company such as hotels and co-working spaces. Places where people work, but where no one wants to see a desk with a white laminate panel top or an office chair with 3D synchronized adjustment mechanism. Using limited space creatively: At Orgatec, Dutch manufacturer Lensvelt stacks the “Boring Collection” to form a furniture totem. It is a similar story with Danish accessory and furniture label Normann Copenhagen, hitherto likewise known mostly for zeitgeisty living interiors. “We grew into the contract market,” says PR Manager Vibe Høst at the label’s exhibition stand in Cologne. “In part this was down to strategy, but in part it just simply happened by itself.” Here too, demand pointed the way that led to the company’s first participation in Orgatec – and on 400 square meters, no less. “We wanted a grand appearance straight off.” The stand is a declaration of belief in the “soft office” or “soft contract,” as the segment beyond rigidly standardized workplace furnishing is known. With velour carpet floors, velvet walls and reflective surfaces, the presentation looks both retro and cool at once. The shell chairs, shelves and little armchairs would suit the lobby of a boutique hotel just as well as the chill-out zone of a startup. Also at Orgatec for the first time is the manufacturer Sancal, presented under the umbrella of Spanish design association RED. The Spanish firm already comes with some experience in the contract sector, as its furniture is used in the offices of prestigious clients such as Google, Facebook and LinkedIn. Sancal’s presentation at the fair emphasizes the company’s playful side with a narrative-led display based around a surreal trip to outer space. Debutant Lensvelt on the other hand has taken an entirely different route. 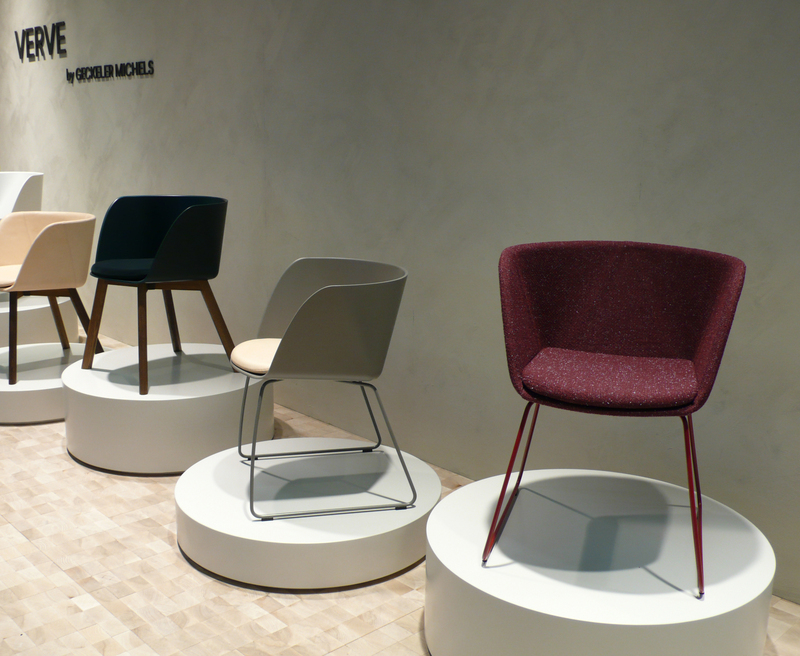 The Dutch manufacturer is showing its “Boring Collection” at Orgatec, which premiered in Milan this year. With the furniture stacked up to form a totem, the Lensvelt stand in Cologne makes do with a minimal amount of space. This is certainly a cost-cutting measure, but it really didn’t need more to present the conceptual Dutch approach. The product range of work chair, desk, storage, panel and accessories is neither soft nor playful, neither glamorous nor stylish, but intentionally uninteresting. The idea behind this is to make office furniture that is as low cost and inconspicuous as possible, while ensuring it conforms to the long list of norms and standards. That way there is more money and attention left over for the non-standardized stuff to go with it: lounge corners, meeting places and kitchenettes. 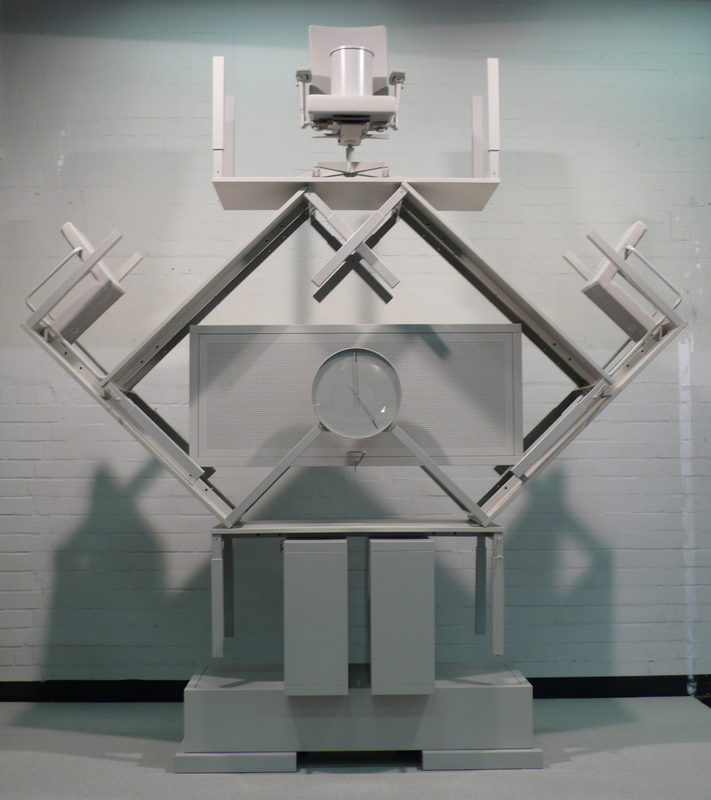 “The collection is very successful,” reveals Lensvelt’s Pieter Kraaijenbrink. 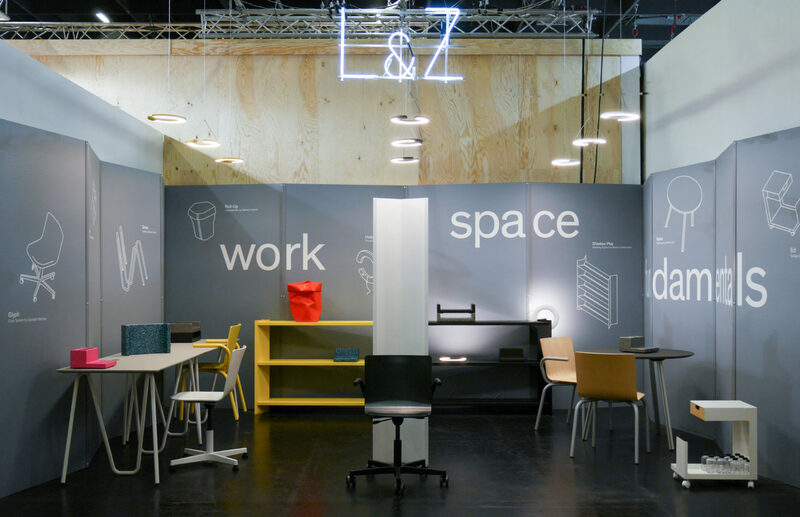 “We’re currently fitting out large office projects in the Netherlands.” The Berlin-based L & Z Elements label is interested in the same market segment: “Alongside providing product solutions geared towards the end customer, we want to increasingly reach architects and planners chiefly looking for project-related solutions,” states Design Director Daniel Lorch. “The project segment is new ground for us. We find it exciting, as it involves designing a working world and a living world.” At Orgatec, L & Z is presenting its newly expanded product portfolio for the first time, which now features contract chairs, a shelving unit and accessories. Normann Copenhagen’s presentation with velour carpets, velvet walls and mirrored surfaces is a clear commitment to the soft office. The comfortable armchairs by Normann Copenhagen work just as well in the lobby of a boutique hotel as in the chill-out zone of a start-up. Not to forget the pull the strong German market exerts on foreign firms, for example Belgian manufacturer Objekten, which has brought a number of new products to its first Orgatec presentation, including a range of side tables by Cologne-based designer Thomas Schnur. Or outdoor specialist Gloster, which sees its elegant sofas, chaise longues and tables as having a place not just in gardens but also on the roof terraces of newly built company headquarters. Danish firm Fredericia on the other hand has returned to Orgatec after many years with a new “soft contract” collection with designs by Geckeler Michels from Berlin. “We have to be here if we want to conquer the German market,” notes a member of staff at the stand. The extent to which the soft segment in particular is changing can be seen in who is missing, too. Indeed, whereas the manufacturers of classic office furniture generally stay loyal to Orgatec, the crossover labels are much more changeable. Hip Scandinavian labels such as Hay, Gubi or Muuto for instance featured at the fair in 2014, but are no longer on board this year. It remains to be seen whether Tom Dixon’s breakout from the comfort zone or Sancal’s space trip into the infinite expanses of Cologne’s trade fair grounds are more than just a Sunday outing – we will know for sure in two years’ time, at the next Orgatec. Among the newcomers to the office furniture fair is outdoor specialist Gloster, which sees its elegant furniture on the roof terraces of newly built company headquarters. 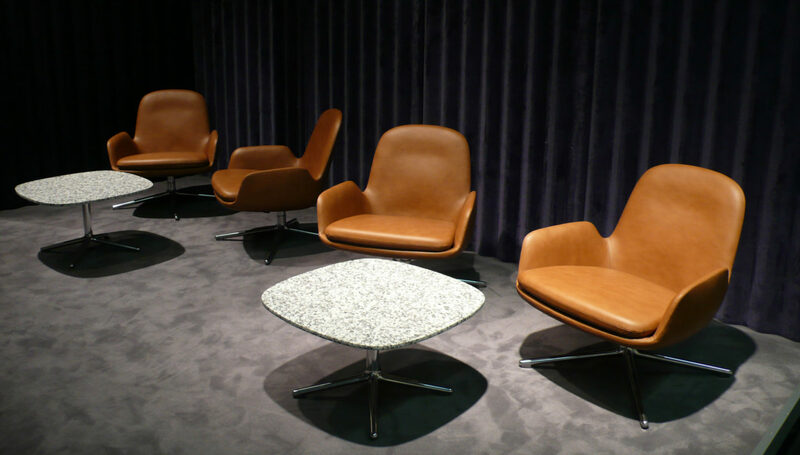 Danish firm Fredericia has returned to the trade fair after many years with the “Soft Contract” collection. At Orgatec L & Z is presenting its newly expanded product range for the first time, with the addition of contract chairs, a shelving unit and accessories, with which it also hopes to reach architects and planners.